Become a Premium member of The Social Business Club®, and become part of an exclusive network and Club Circle for CSR & sustainability professionals, who want to exchange more, learn more, and do better. As a Premium member you become part of an exclusive Club Circle with 5 annual half-day learning & networking sessions designed around themes selected by the members. Here you can talk, listen, reflect and learn – so you can take informed action! 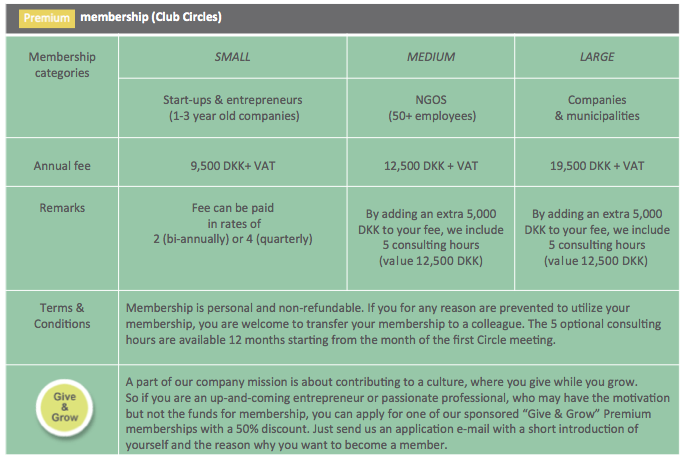 We are launching new Club Circles for our Danish Premium members in 2017-2018. Read all about them here.